Science Minister, Sam Gyimah, visited the Edinburgh Centre for Robotics at the University of Edinburgh on 3 August where he met with Scottish Deputy First Minister, John Swinney MSP to discuss the economic opportunities for the UK and Scotland in Robotics and Artificial Intelligence (AI) which are being developed as part of the £100 million National ROBOTARIUM. 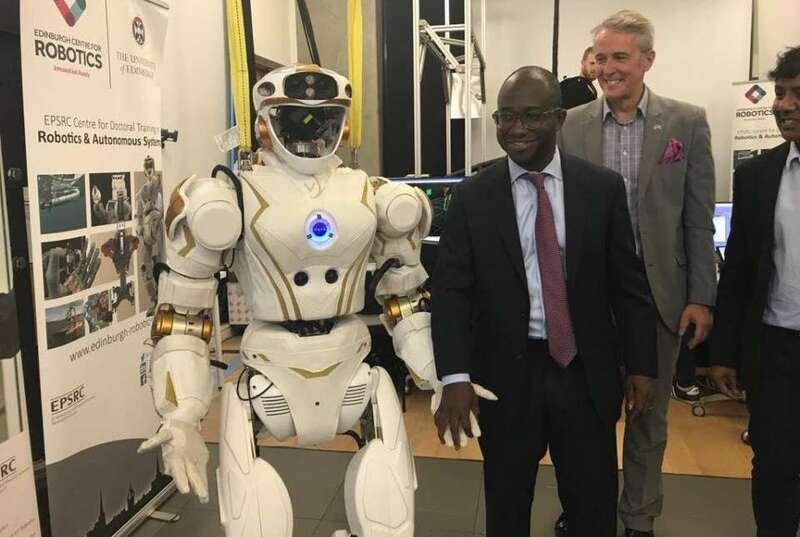 Mr Gyimah joined ORCA Hub Directors, Professor David Lane and Professor Sethu Vijayakumar, and Hub Manager, Dr Lindsay Wilson for a tour of the Edinburgh Centre for Robotics facilities at the University of Edinburgh. There he got to meet ANYmal - used in the ORCA Hub work - and NASA’s ground-breaking humanoid robot, known as Valkyrie, which joined the Edinburgh Centre for Robotics in 2016 following the University of Edinburgh’s collaboration with NASA JSC on aspects of Valkyrie’s design and control. Fantastic to see the exciting research being done in the robotics, medicines and photonics sectors. Mr Gyimah’s visit was followed up on 8 August by Scottish First Minister, Nicola Sturgeon’s own visit to the University of Edinburgh to formally agree the Edinburgh and South East Scotland City Region Deal. The City Deal is a £1.3bn investment designed to accelerate productivity and inclusive growth through the funding of infrastructure, skills training and innovation through which the National ROBOTARIUM will be developed as a joint venture between Heriot-Watt University and the University of Edinburgh. The new funding will help to drive forward the development of Robotics and Autonomous Systems technologies through the creation of a world-class hub which will build upon existing research expertise, skills and industry partnerships already in place in Edinburgh.